Fish Feeding at the famous Aquascene (Doctor’s Gully). 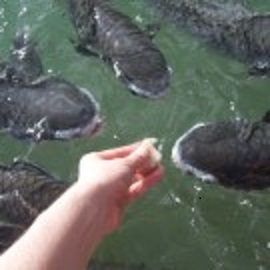 Feed the fish from the comfort of the concrete stairs of the viewing platform or wade into the water and have them tickle your feet as they jostle over each other to take the bread from you. A well know Darwin family attraction. Visit the Botanical Gardens and drive through East Point with commentary provided by driver.